If you know Emma Giloth (I am her cousin), it would have been very hard over the past year to not have heard of or to have your interest piqued by Bégué Coco. From afar, I watched it grow from an idea into a full-fledged reality – from an informal coconut stand to a full-fledged social business. Luckily for me, I had the opportunity this fall to come over to Dakar for three months, live with Emma, and work on continuing to grow and evolve Bégué Coco. Coming off of a year and a half as an Account Executive at a Communications Firm in New York City, I was excited to use my expertise to work on Bégué Coco graphics, overhauling the website, launching and maintaining the Social Media channels, and developing a Digital Strategy for the business. Since arriving in late September, we have launched a Twitter profile for Bégué Coco, implemented a design and content overhaul on the website, and developed a new look for our product labels and printed collateral. Having a defined presence on the web through a dedicated website, and profiles on Facebook and Twitter is essential for any business in this day in age. 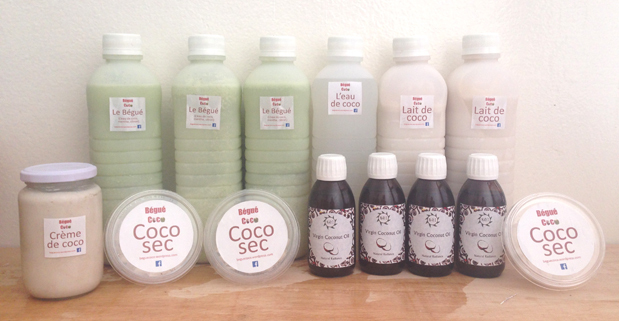 On a practical level, they important for attracting those local to Dakar to learn more about the benefits of the coconut, to educate them on the all-natural products that we offer, and hopefully interest them in joining us for a Yoga Class at the Bégué Coco Cabana on Yoff Beach. However, they also function as a forum to educate the global audience about the work that we are doing, why it is important, and what they can do to get involved. As someone who followed the story of Bégué Coco from the United States and who invested in the Indiegogo crowd-funding campaign this past summer, it has been very rewarding to witness it’s impressive reality in action in Dakar. The next step is learning how to cut open a coconut without chopping my hand off.